Our sales departments and rentals departments work closely together and have many long standing investment landlords who have bought properties through us and which we let out and fully manage for them. The Central London rentals market is very competitive with many private landlords investing in property to rent out. Tenants expect higher standards of accommodation than ever before. More and more people are relocating to the UK and to London in particular. The corporate rentals market is still strong but tenants are requiring newly decorated and renovated properties with stylish interiors. The international student market is also a significant tenant source, with more universities and more international students in London than any other city worldwide. 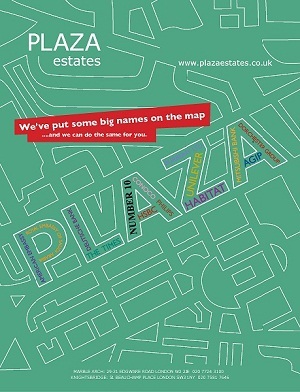 However, many new landlords are unfamiliar not only with the legal and financial elements of renting out their property, but also with the standards currently demanded..
Plaza Estates are central London property specialists, we have over 40 years experience in property rentals. Our data-base is one of the most sophisticated in London and our list of contacts one of the most extensive. Residential Lettings | Information for Tenants | Hot Tips for Landlords | Letting your Property | Deposit Protection Scheme | Valuations | Relocation | Why Us?